The commitment to serve with sincerity, diligence and honesty will be your greatest strength in trying to become a great leader, says Rosy Akbar. The Minister for Women, Children and Poverty Alleviation was speaking to the new leaders and prefects of Andrews Primary School in Nadi yesterday. “Having a caring, compassionate heart to listen to others and helping them is what defines a true leader,” she said. Ms Akbar told the 145 leaders that their badges were only a reminder of the responsibilities placed upon their shoulders. 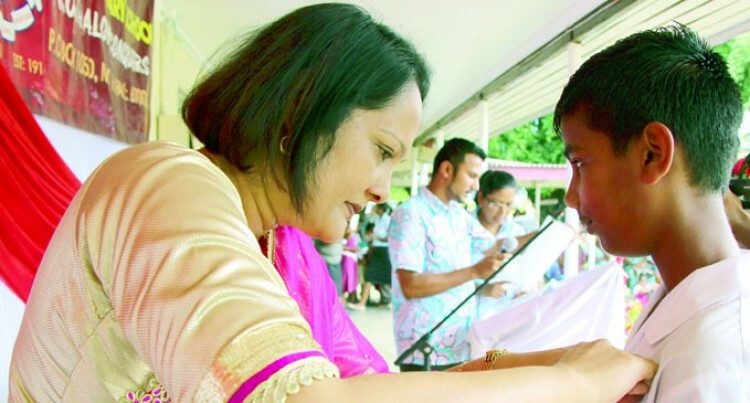 School headboy Nimish Prasad said he planned to make the work for teachers easier with the support of student council and his family he would carry out his responsibility o the fullest. “I am happy and proud and with the help of the student council we will carry out our responsibilities,” the 14-year-old said. There are 950 students and close to 30 teachers at Andrews Primary School.